If you want to protect your images from unauthorized use, adding an image watermark to each of them is the best solution. The image may contain your name, the logo of your photography studio or the one of the company which owns the copyrights for the images. Some photographers opt for a discrete watermark image in one of the photo's corners, while others prefer a transparent one that covers a larger part of the image. reaConverter provides a user-friendly interface that helps you do batch image watermarking and allows for customizing the size, position and opacity of the image watermark. Open one or more images you intend to watermark. Select them one by one, add entire folders or use the handy drag-and-drop tool. 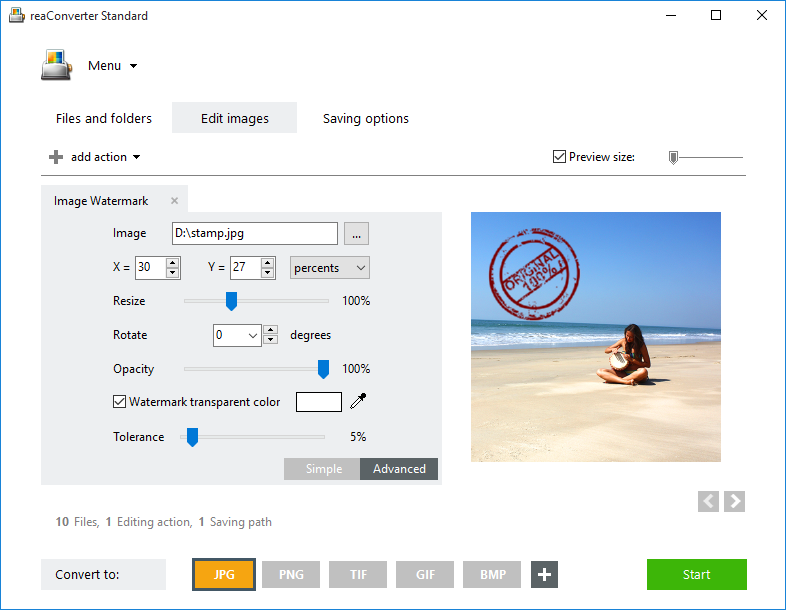 Here you can opt for the simple watermarking interface, where you just add the desired watermark image and the coordinates defining its position on the image, or the advanced one. 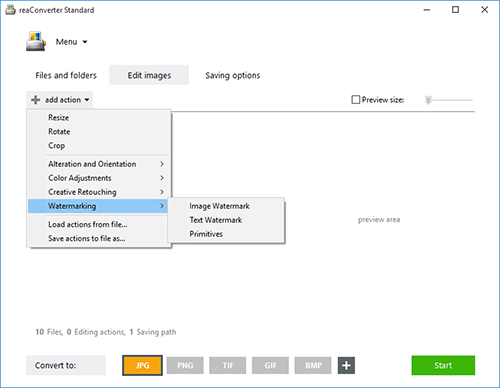 The latter allows you to resize, rotate and set the opacity of the watermark image, as well as customize the color tolerance and transparency of the watermark. Go to the Saving options tab and pick a location for your watermarked images. You can save them locally, in the source folder or in a newly created one, or online. Moreover, you can change their extension by simply clicking on one of the buttons placed in the lower part of the screen. 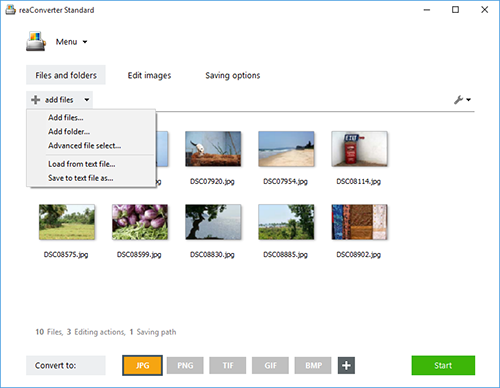 reaConverter supports conversion to and from an extensive number of image formats. Finally, click the Start button and you will soon be able to enjoy your newly watermarked image files! Command-line watermarking tool is an advanced feature meant for professional use, and is available in Pro edition only.